The Porsche 918 Spyder is a mid-engined sports plug-in hybrid designed by Porsche and first shown as a concept at the 80th edition of theGeneva Motor Show in March 2010. The Spyder is powered by a 4.6 litre V8 engine, developing 580 horsepower (430 kW), with two electric motors delivering an additional 243 horsepower (181 kW). It is the first plug-in hybrid car from Porsche. Porsche intends to manufacture 918 units as a 2014 model year starting production on September 18, 2013, with deliveries scheduled to begin in December 2013. The starting price is rumored be €768,026. Porsche unveiled the RSR racing variant of the 918 at the 2011 North American International Auto Show, which combines hybrid technology first used in the 997 GT3 R Hybrid, with styling from the 918 Spyder. 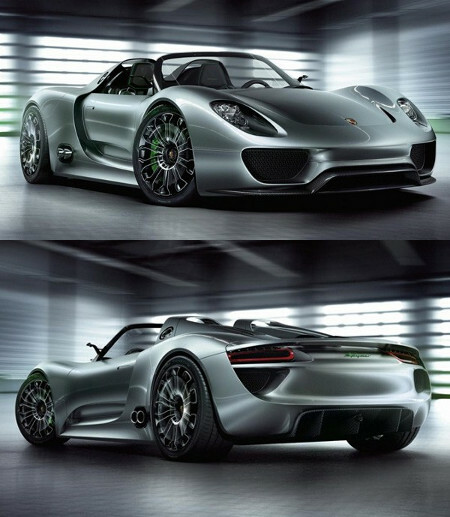 The 918 Spyder is a mid-engined two seater supersports car designed by Michael Mauer. It is powered by a 4.6 liter V8 engine which is a development of the engine used in the RS Spyder Le Mans Prototype racing car. The engine delivers 580 horsepower (430 kW) at 8,500 rpm and 500 N·m (370 lbf·ft) of torque. This is supplemented by two electric motors delivering an additional 240 hp (180 kW). One 85 kW (114 hp) electric motor drives the rear wheels in parallel with the engine and also serves as the main generator. This motor and engine deliver power to the rear axle via a 7-speed gearbox coupled to Porsche's own (PDK) double-clutch system. The front 95 kW (127 hp)electric motor directly drives the front axle; an electric clutch decouples the motor when not in use. The total system delivers 823 hp (614 kW) and 780 N·m (580 lbf·ft) of torque. As of October 2012 the engineering design is not finalized, but Porsche has given performance figures of 0–100 km/h (62 mph) in 2.8 seconds and a top speed of 325 kilometres per hour (202 mph). The energy storage system is a 6 kW·h liquid-cooled lithium-ion battery positioned behind the passenger cell. In addition to plugging in to recharge, the batteries are also charged by regenerative braking and by excess output from the engine when the car is coasting. CO2 emissions are 70 g/km and fuel consumption is 3 L/100 km (94 imperial mpg/78 us mpg).